Travel back to the days of the Wild West when would-be pioneers were flooding the undiscovered terrain of the west and panning the crystal clear rivers for gold! Click here to play! Dip your pan into this stream for a chance to bring in your own golden fortune. As you're new to panning for gold, you'll want to let the prospector guide you though it. Spin three of these friendly pioneers across the single pay line and you will bring in the top prize of 400 coins. He also acts as a wild symbol and will replace all other symbols to help you create more wins! Don't forget to get your pan into the stream for a chance to bring in some nuggets. 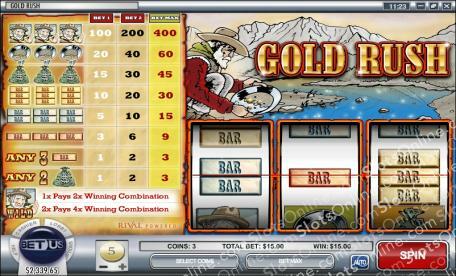 Three gold pans across the pay line will get you up to 60 coins. It won't be long before you're trading your nuggets for sacks of cash. Three bags of green will get you up to 45 coins. Triple, double and single BARS will also bring in good money. As will several other combinations such as any two BARS or any two sacks of cash! You'll have to be sure to bet the max of three coins to activate the highest pay table. Get to the west for a chance to pan the mighty rivers for your share in the golden fortune! The friendly prospector acts as a wild symbol and will replace all other symbols to help you create more winning combinations.